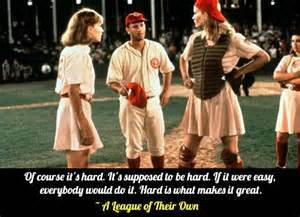 I love the movie, "A League Of Their Own", and this quote from the movie...."Of course it's hard. It's supposed to be hard. If it were easy, everybody would do it. Hard is what makes it great." There are days when Michael's workouts seem ridiculously hard and there are times when I'm in the middle of one and wonder if I'm going to survive it. Like the other day I had a hurricane workout and then had a finisher where I rowed so many meters EMOTM. I even made the comment I felt like my legs were going to fall off. There are even workouts that are so intense I actually get pissed at him while I'm doing the sets and would like to reach up and punch him in the face (it's okay, I'm sure he has the same feelings when I whine...lol). There have been times when he's corrected the way I do something and it ends up making the exercise harder, and normally it's something as small as just pulling my shoulders or chest back. And when I do make the comment that made it harder, he'll reply "It's supposed to be hard." or "But did you die?" And he's right, it's supposed to be hard. If it's not hard is the workout really effective? And even though I really try not to whine, I do have days I whine or complain more than others about the difficulty, but the important thing is I don't stop or give up. One of the things I've noticed is the harder and more intense the workout is the better I feel once I've finished. I might be laying on the floor or taking my time to make my way to the showers because I'm waiting for the feeling to come back to my legs, but once I'm up and moving all I can say to myself is "That was another Epic Watkins Workout!" So, when you're working out and you feel it's too hard just remember it's supposed to be hard, that's what makes it great!